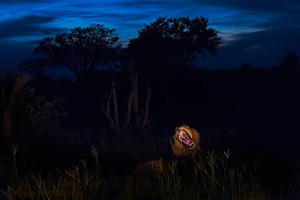 Lion getting ready for the night-hunt under an approaching thunderstorm in Hwange NP, Zimbabwe. Day before yesterday. Im now working with the Nikon D810 together with my D4s and the D810 is just amazing! The image is shot on 10 000 ISO! Henrik Karlsson/N wildlife photographer and myself are now sponsored by Nikon and the D810 is a part of a promising cooperation.